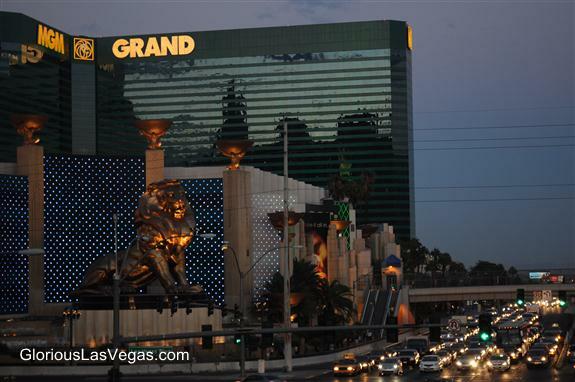 There are lions at the MGM Grand hotel!! Real live lions! Not roaming around the casino floor but in a specially designed “Lion Habitat” in the casino. The lions are apparently descendants from the original Leo The Lion who was MGM’s mascot – the lion you see roaring at the start of their movies. There are around 30 lions altogether, the majority being female and they actually live on a ranch just outside Las Vegas. Everyday, six or so lions are brought to the MGM where they spend the day prowling around their area. There’s a glass tunnel you can walk through so you can feel like you’re really getting close to the cats. I was really excited to hear about the lions and was looking forward to seeing them, but I’ve got to say that it was a bit of a let down and I left feeling really quite sad. Read why after the jump. Still, if you’ve never seen a lion before – and you’d like to – this is a guaranteed chance to see a small pride together… but if you’re lucky enough to have seen lion before in the wild then this probably isn’t the thing for you. There’s something absolutely magnificent about seeing wild lion, not least because they’re so elusive, and seeing them padding around in a limited space behind thick glass just doesn’t have quite the same impact.